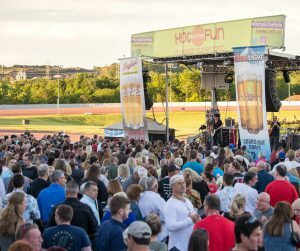 WILKES-BARRE, PA (May 17, 2018) – It is almost time for live tribute bands to perform at Mohegan Sun Pocono for 13 weeks bringing hot entertainment all season long. Enjoy Throwback Thursdays in Breakers throughout the month of June and beginning in July, guests can head to The Downs at Mohegan Sun Pocono as Party on the Patio returns, taking place every Thursday from July 5th to August 30th. Throwback Thursdays will have you dancing and singing along as tribute bands perform live at Breakers every Thursday in June beginning at 7:00pm. This year, tickets are available with a $10.00 donation at the box office, located at Player’s Club starting on Monday, May 21st at 8:00am. All ticket donations will benefit WNEP’s Ryan’s Run 9, an organization “Inspiring fitness. Challenging disability. Changing Lives.” that supports the work of Allied Services: making miracles in rehab, helping people regain health and independence after an injury, improving quality of life for people living with Parkinson’s or recovering from a stroke, empowering children to overcome a learning disability and much more. Party on the Patio returns to The Downs at Mohegan Sun Pocono every Thursday from July 5th to August 30th. Unwind and have fun enjoying free live music with an impressive line – up of tribute bands along with food trucks and drink specials. Doors open at 6:30pm and music begins at 7:30pm and admission is free to the public. For more information on Party on the Patio, visit here. Mohegan Sun Pocono, owned by Mohegan Gaming & Entertainment, was the first destination to bring gaming to Pennsylvania in 2006 and since then has become one of the premier entertainment, gaming, shopping and dining destinations in the state. Situated on 400 acres in Plains, Pennsylvania, Mohegan Sun Pocono features a 238-room hotel with on-site spa and adjacent 20,000 square-foot Convention Center. It is currently home to 82,000 square feet of gaming space including 91 live table games, 2,300 slot machines and electronic table games, a variety of dining and shopping options, nightlife, entertainment and live harness racing. Mohegan Sun Pocono is within easy access of New York, Philadelphia, New Jersey and Delaware. More information is available by calling 1.888.WIN.IN.PA (1.888.946.4672) or visiting our website. Connect with us on Facebook, follow us on Twitter or Instagram, download our app and view us on YouTube.